This is one of the most beautiful and decorative of our indigenous conifers, a tree that any plant enthusiast would be proud to have in their garden. With its dense glossy foliage, it makes a most elegant pyramid of green in the garden. In its natural environment Podocarpus henkelii is a tall to very tall, straight stemmed forest tree, reaching 20 to 30 m in height. In time, its trunk can grow to massive proportions, reaching over 1m in diameter, becoming fluted and spirally twisted with age. 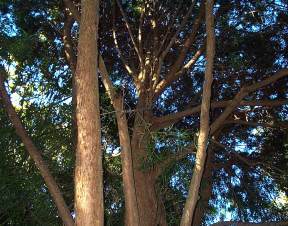 It is an evergreen tree with a dark grey to pale grey-brown, longitudinally fissured bark. In older trees this bark sometimes peels off in large pieces, exposing a red-brown under-surface. It has grey and ridged branchlets and the young shoots are pale green and angular. The leaves are simple, short stalked, lanceolate-oblong, 9-12cm long, sharp pointed, with entire and slightly revolute (rolled under) margins. They are spirally arranged, often crowded at the end of the branchlets, and more or less pendulous. The longer, droopy leaves make it easy to distinguish this species from the other yellowwoods growing in South Africa. Podocarpus henkelii has straight or somewhat falcate (sickle-shaped) leaves, hence it was once called the falcate yellowwood. This name had to be dropped because it was confused with Podocarpus falcatus, the Outeniqua yellowwood. The leaves of Henkel's yellowwood are bright green to bluish green and glossy above, dull green with a prominent midrib below. The young leaves are pale green and soft. This handsome tree is dioecious, i.e. it has male and female reproductive organs on separate plants. Yellowwoods belong to a primitive group of plants called the Gymnospermae. Gymnosperms, often called conifers, are cone-bearing plants, distinguished from the other major plant group, the Angiospermae or flowering plants, as their ovules and resultant seeds are borne unprotected in the cone whereas in angiosperms the ovules and seeds are protected in an ovary. Other gymnosperms include cycads, pines and cypresses. Male Podocarpus henkelii cones are erect, pink, and 2-3cm long and are solitary or in clusters of up to 5. Female cones are solitary, but shortly stalked. 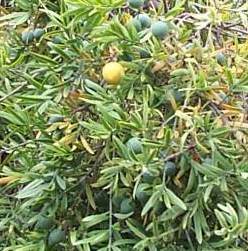 The seed is large and roundish and 1,5-2cm in diameter and olive green to yellowish green when ripe. 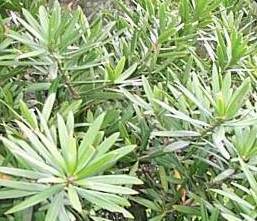 Podocarpus henkelii is moderately drought-resistant and frost hardy. This is a highland forest species that grows best on moist sites with high rainfall and deep doleritic soils. This tree is protected by SA Forestry Legislation as well as Nature Conservation Legislation. 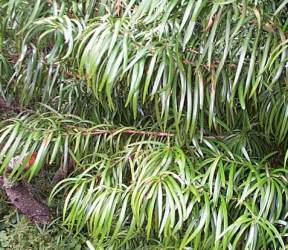 Podocarpus henkelii is found from the former Transkei in the Eastern Cape to KwaZulu-Natal. It is most abundant in moist inland forest, locally common in montane forest of the Northern KwaZulu-Natal Drakensberg. 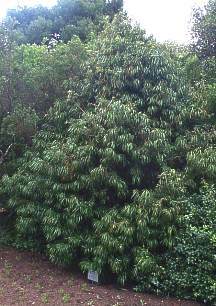 The largest concentrations of Podocarpus henkelii are found in areas between Mt Ayliff, Kokstad and Harding. Podocarpus henkelii was named after Dr JS Henkel (1871-1962) a conservator for forests in the Cape Province and KwaZulu-Natal, and later director of forestry in Zimbabwe. He was the first to recognise that this is not a variety of Podocarpus latifolius but a distinct species. The genus name is derived from Greek words podos a foot and karpos a fruit, referring to the fleshy fruit-stalks in some species. There are nearly 100 species in this genus, found mainly in the montane forest of the tropics and sub-tropics and at lower altitudes in temperate regions mainly in the southern hemisphere. 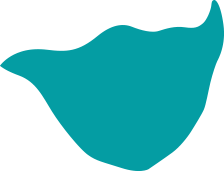 There are four species in southern Africa, distributed in Northern Province, Mpumalanga, Swaziland, Free State, KwaZulu-Natal, Western Cape and Eastern Cape. At Kirstenbosch National Botanical Garden we have good specimens of all four southern African species: Podocarpus henkelii, Podocarpus elongatus, Podocarpus falcatus and Podocarpus latifolius. The yellowwoods in general are regarded as South Africa's national tree, although sometimes Podocarpus latifolius is singled out for this honour. 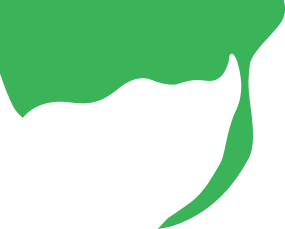 Wood, especially that from P. falcatus and P. latifolius is prized for furniture making and was used extensively in the past for floor and ceiling boards. Seed is dispersed by birds. Large old yellowwood trees form the perferred nesting sites of the Cape Parrot (Poicephalus robustus) and the kernels of the seeds are a major source of food for this bird. Podocarpus henkelii is a very neat decorative tree suitable for both home gardens and large landscapes. It makes and excellent specimen tree for lawns and is a good choice for an avenue. Podocarpus henkelii is also suited for formal gardens, as it can be pruned to the desired shape. It can also be left to achieve an informal finish. Seed collection from this tree is a struggle as the fungal disease black coral spot destroys many of the seeds. The seed that falls during the first 2-3 weeks is always highly infested, only the seed collected afterwards is good. The seed is perishable and must be kept in cold storage after collection. Under normal nursery conditions, seed germination takes 2 months. The germination period can be shortened by placing the seed trays on bottom-heated benches. 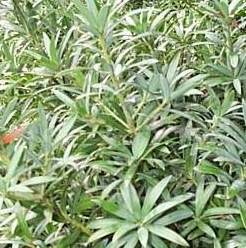 Podocarpus henkelii grows best in deep and moist, sandy or loamy soil. It can tolerate less favourable sites, but then grows very slowly. Judicious application of organic fertiliser will speed up growth. 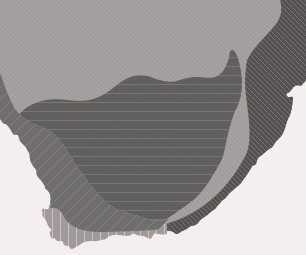 Palmer, E and Pitman, N., 1972, Trees of Southern Africa, A.A Balkema, Cape Town.